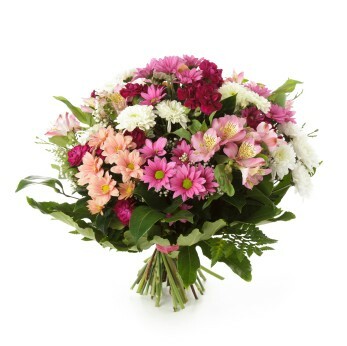 Florianopolis Flower Bouquet will delight recipient with this combination of daisies, carnations and Peruvian lilies. Colorful and exhaling good sentiments this bouquet is ideal to wish happy birthday, say thank you or simply to say 'I am thinking of you'. On the next step you will have the option of making your gift even more special by adding a vase, chocolates and other products. Dazzling bouquet filled with love and positive energy to give as a gift to someone in Brazil. This combination of joyful mixed flowers will be a success. You made someone very happy ! "You made the recipient of the flowers very happy and the flowers were gorgeous…Thank You!! "